The lightweight and state-of-the-art Raspberry has been designed from the ground up to be the perfect urban stroller. A lie-flat seat unit means it’s suitable from birth, and the compact fold and agile chassis make it easy to nip around town. The parent or world-facing seat unit features a memory foam layer for additional comfort, and the innovative concealed storage pod is perfect to store your raincover, phone or keys. City dwelling parents need look no further than the iCandy Raspberry – lightweight, compact and nimble enough to navigate even the busiest of streets. With an optional new carrycot making it suitable from birth, a parent- and world-facing seat configuration, a compact footprint, an agile chassis, and now featuring iCandy’s trademark elevator adaptors, the iCandy Raspberry is city living incarnate – and the ultimate pushchair for urban parents. 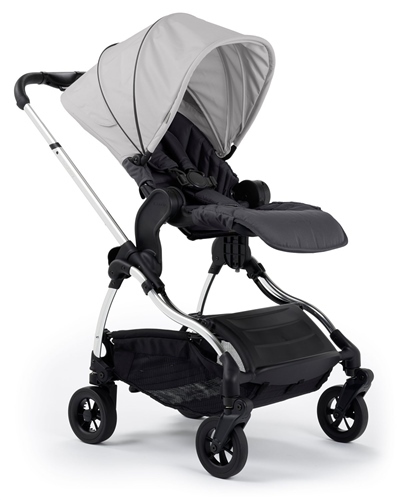 A feature unique to iCandy, our Elevator Adaptors raise the height of the seat unit and carrycot to allow better parent and child interaction and also mean less bending. In world-facing mode the elevators also allow the seat unit to be used as a high chair – just roll up to a table. The Raspberry is available in different colourways with interchangeable flavour packs compatible with either a Chrome or Moonrock chassis. Can be parent or world facing. 4 wheel independent suspension with new innovative tyres provides you with an extremely smooth ride. Large storage basket which can hold up to 5kgs with easy access. The following car seats are compatible with the iCandy Raspberry when used in conjuction with the iCandy Raspberry Car seat adaptors, which are sold as an optional extra.